Bring all injection ingredients to a boil in a small saucepan; reduce heat and simmer until dry ingredients are dissolved. Let cool to room temperature. Inject mixture into pork, being careful to distribute all the liquid. Cover and refrigerate for 2 hours. Stir together all spice rub ingredients in a small bowl and sprinkle over surface of pork. Pour barbecue spray ingredients into a spray bottle. Place pork on a preheated 250 degree F. grill with peach wood or hickory chunks. Cook for about 5 hours or until pork reaches 165 degrees F. internally, spraying every hour with barbecue spray. Remove from grill and place in the center of a large sheet of heavy duty foil; shape foil into a bowl around pork. Pour 1/2 cup barbecue spray over meat; cover with foil and seal tightly. Place back on grill and cook for about 4 hours or until meat reaches 195 degrees F. internally. Carefully remove pork from foil and place directly on grill. Glaze with peach preserve mixture and cook until shiny and caramelized. 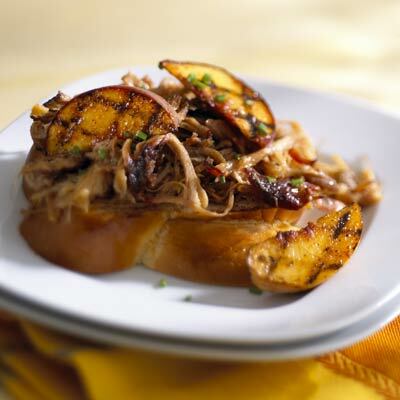 Remove from grill and shred using two forks, then moisten with any remaining peach glaze. Set aside and keep warm. Meanwhile, stir together peach gelatin and cayenne pepper. Dip peach wedges into mixture and let stand to dissolve. Cook on a well-oiled grill until well-marked and tender. Brush with molasses and remove from grill; drizzle with balsamic vinegar. Spread brioche slices with butter and cook on a sheet of heavy-duty foil placed directly on the grill to form a "griddle." Toast both sides of bread over medium heat, then season with salt. To serve, place serving of pork on top of brioche. Top with grilled peaches and sprinkle with chives. Developed by Chef Adam Perry Lang, Daisy May's BBQ in New York City for the California Tree Fruit Agreement.